Whistler is the place to be in the summertime, with its secluded lakes, epic bike trails and exceptional dining scene. The Sunday Farmers Market, located at the base of Blackcomb, is also a major must for the whole family. This summer, they’ve seen an average of 80 vendors out per week, making it one of the biggest markets in BC. A few vendors I highly recommend seeking out: The Simple Spoon, who specializes in local, vegan organic cuisine. Try one of raw chef Sharon Wu’s Cashew Cream Fruit Parfaits or an Icy Mint Berry Smoothie. Goldstrike Honeybee Co. is another regular vendor who’s organic product from Lillooet is one to stock up on. Lastly, for truly organic blueberries that you really don’t even need to wash, find Hare’s Farm who grows their blue beauties in nearby Pemberton. 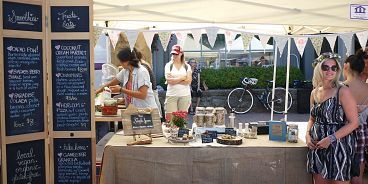 The Sunday Whistler Farmers Market runs every sunday of the Summer until October 12th. There’s also the Wednesday Whistlers farmers market happening until August 27th.